Although it is erroneously treated as a subspecies, the dwindling African forest elephant is a genetically distinct species. New University of Illinois research has found that forest elephant populations across Central Africa are genetically quite similar to one another. Conserving this critically endangered species across its range is crucial to preserving local plant diversity in Central and West African Afrotropical forests–meaning conservationists could save many species by protecting one. "Forest elephants are the heart of these ecosystems–without them, the system falls apart, and many other species are jeopardized," said the principal investigator of this research, Alfred Roca, a professor of animal sciences at the Carl R. Woese Institute for Genomic Biology and College of Agricultural, Consumer and Environmental Sciences (ACES). Published in Ecology and Evolution, this recent study analyzed the nuclear DNA of 94 forest elephants from six locations. Forest elephant nuclear DNA is genetically diverse, yet this diversity is consistent across populations throughout Central Africa–any differences are too small to warrant treating them as distinct subspecies. 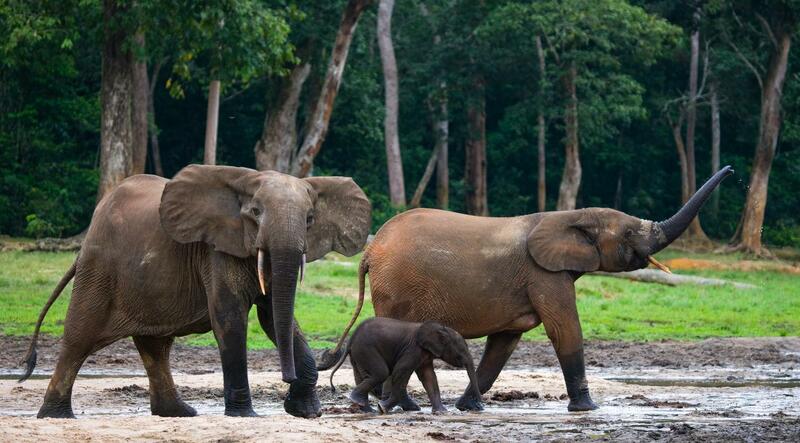 This nuclear DNA lacks the geographic patterns preserved in forest elephants' mitochondrial DNA, the small proportion of the genome that is passed down only from mothers to their offspring. The mitochondrial DNA suggests that five genetically distinct populations existed in the past, most likely due to the Ice Age when their habitat was greatly restricted. "Forest elephant's seemingly discordant DNA can be easily explained by their behavior," said lead author Yasuko Ishida, a research scientist in ACES. "Their mitochondrial DNA is a relic preserved by their matriarchal society." Females live together in matrilineal family groups, a herd is made up of related females who share the same mitochondrial DNA. Nuclear DNA diversity is controlled by the largest, mature males who travel long distances and promote gene flow by mating with distant females. Thus, females ensure mitochondrial DNA persists in local populations, while males ensure that the nuclear DNA is shared across populations. "However, all of this precious DNA may soon be eradicated as forest elephants face extinction due to poaching and habitat loss," Roca said. "Between 2002 and 2011, poachers wiped out more than half of their population. Fewer than 100,000 forest elephants are estimated to remain today–we must act swiftly to preserve them, and by extension, their habitats." This work was supported by a U.S. Fish and Wildlife Service African Elephant Conservation Fund Grant. Samples were collected with the permission of the governments of Botswana, Cameroon, Central African Republic, Democratic Republic of Congo, Gabon, Kenya, Namibia, Republic of Congo, South Africa, Tanzania, and Zimbabwe. The paper "Evolutionary and demographic processes shaping geographic patterns of genetic diversity in a keystone species, the African forest elephant (Loxodonta cyclotis)" is published by Ecology and Evolution (DOI: 10.1002/ece3.4062). Co-authors also include ACES undergraduate student Natalie A. Gugala and Nicholas J. Georgiadis, Senior Research Scientist at the Puget Sound Institute at the University of Washington Tacoma. The Carl R. Woese Institute for Genomic Biology at the University of Illinois is a research facility dedicated to tackling grand societal challenges using team-based strategies as well as transformative research and technology in the life sciences.